I have a confession to make: I shave my face. I’m not a hairy person and have a very thin layer of invisible peach fuzz on my face, but for the past few years, I’ve made shaving the lower half of my mug a semi-regular thing. Why? I love, love, love how my skin feels afterward. And I don’t know if this is a real thing, but it makes my moisturizer feel like it’s working better. 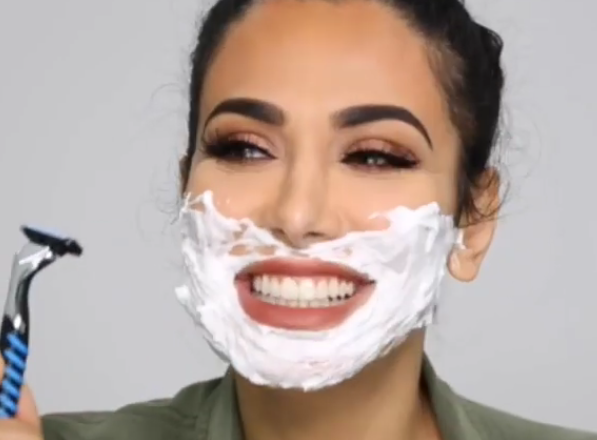 Apparently I’m not the only one, because one beauty vlogger just posted a video boasting about the benefits of face shaving. She adds that it’s been “going on for decades in Asia” because it helps with skin exfoliation and makeup application. “It’s not applying shaving cream all over your face, taking a razor, and actually shaving your face,” she adds. Instead, buy a straight safety razor — easily found in beauty supply stories — and use it to basically scrape the fuzz off your face. “I started doing it and I love it, I cannot stop doing it and I actually do it to my clients before putting makeup on their face because it just looks so much better,” she adds. Face shaving only takes a couple of minutes, and it doesn’t produce the same ingrown hairs that regular shaving can — just make sure you shave in the direction of hair growth (down) instead of against the grain. “I have lasered areas that have slightly thicker hair and def recommend that for areas around the mouth and chin and sideburns, but if you have areas where the hair is super thin and more like peach fuzz, you may find this is your best bet,” she added. The only thing she gets wrong in the video? She recommends dry shaving — which, yes, is best because it’s easier — because she claims shaving wet will make hair grow back faster. That’s not true. But as for the rest? Follow her tips for a fuzz-free face (if that’s what you want), and I guarantee you won’t be able to stop touching it.